The CM-1500 gives impressive production rates versus cost in the insulation machine industry. If you want mobility with low power requirements and high production, then this is for you. In-fact, it will take you closer to higher production of large machine capabilities. Insulation was never been so easy but this gives you freedom to cover your quick production needs. 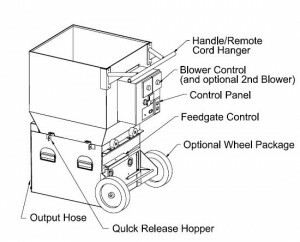 The many options (blowers, input power, wheel package), offer choices to the small contractor that require versatility, production, and low maintenance in a high endurance machine. 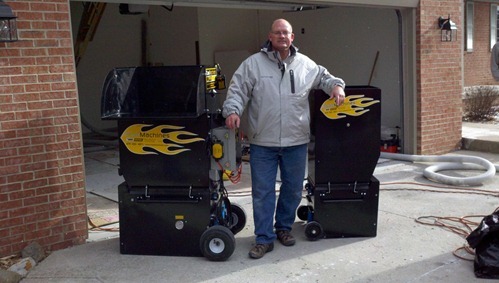 (scalping augers /shredder) A Great Choice for the Weatherization Contractor. We are very excited to own our Cool Machine 1500 Model here in Alaska. To date, two different contractors have used this machine and each one raved about it. Im not used to folks in the insulation industry getting so excited about doing such hard work! I love it! The Cool Machine is powerful, easy to use and operate and makes a tough job much easier. One of my favorite parts though, is working with Barry, he has the best customer service I have seen in years. Barry is responsive and knowledgeable. The customer can tell that he cares about what he does and it is not just a business transaction. That means a lot to me in todays market. We have recommended him and the Cool Machine to three other contractors already. I like the sturdy design of the unit and when people talk about it they don’t even notice that they say, That is a really cool machine! We purchased a CM1500 in mid July of 2011. It performs just like you said it would. It is a solid hard working addition to our bottom line. We will definitely purchase from your company on our future needs and upgrades. Barry, Just wanted to drop you this email to thank you for all your help. The CM 1500 that you said would do the best job for what I needed at this time is working fantastic. A well built machine, I’m glad I went with this one. The help that I needed after the sale is what I really like, not to many business people do that, great Job! I will recommend you to others. Affordable Insulation is an up-start company in LeMars, Iowa. They purchased a CM1500 to do dense pack as well as wall spray cellulose. Hurricane Michael ravaged Panama City and the trades have a difficult time keeping up. Insulation Specialists purchased a CM1500HP. This Energy Efficiency company in Tulsa, Oklahoma is now insulating. They purchased our upgraded CM1500HP. Here is their review. Using a [other brand] insulation machine was neither providing the production nor the even blowing that this company wanted. Located in Baton Rouge, Louisiana, this company provides their thoughts. This spray foam contractor already owned a CoolVac16 and wanted to add another Cool Machine branded machine to his company. They now offer blown in fiberglass and cellulose. We trained a spray foam insulation company in Corydon, Indiana. Using cellulose, we were able to insulate a 2,000 sq ft house within 2 hours. Orangutan Services in Phoenix purchased a CM1500. We visited them in Phoenix, Arizona and trained them on installing fiberglass, ventilation and securing the attic access to keep it from drafting air. If you are looking to add a convenient recycling option to your machine (Cool brand or not), this recycler is effective. K-13 cellulose is applied over 2 of foam. The metal roof of this commercial building, located in Battle Creek, Michigan, is treated with 2 of polyurethane foam. K13, an acoustical / fire-resistant cellulose insulation is glue-sprayed on the foam to provide a nice, noise reducing environment. For faster access to airlock it has quick release hopper with easy handling and transport. For long lasting finishes with corrosion resistance it uses high quality powder coating. Quick release auger provides easy access to airlock seal replacement and service. Slide-gate control provides precise control of fiber. 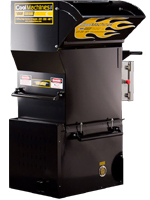 Dual scalping augers /shredders increase fiber conditioning while providing consistent flow. #40 nickel plated chain and hardened sprockets, are rugged, and corrosion resistant. One or two integrally mounted 2 or 3-stage blowers w/check valve and filter protection. Modular design with see-thru access panel for quick troubleshooting and maintenance. 100 ft. dual function (3-position) remote cord w/cord hanger, offers control and convenience. It has extensive safety features. sill switch and manual override controls promote increasing operator safety and quick hazard response. For accessory devices it includes duplex auxiliary outlets. Deluxe voltmeter for quick electrical diagnostics and low voltage protection of motors. Material: Different materials may produce varying results. Even though our machines come standard with a 150 3-way remote. If you want the instantaneous control of your machine, with over 500 of remote control, this wireless unit performs well. The Yellow Jacket Pro 3-button control with Hawkeye transmitter. This accessory is designed for CM1500s that are mounted in a trailer or truck. The filter vent covers the existing filters and allows the machine to pull in fresh air through the floor or wall of a truck or trailer. We carry all the hoses, reducers and wall tubing for you to go from the 3 hose to 2/1.5/1.25 and even a brick nozzle. 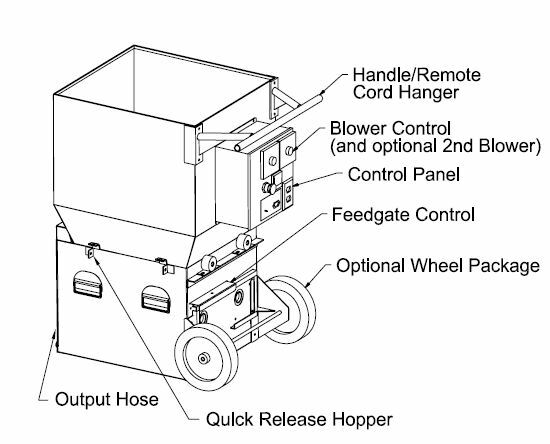 Our standard 34 wall-mounted hose reel holds up to 150 of 3 hose or 200 of 2 1/2 hose. This system reduces the cloud effect when blowing cellulose into an attic or open area. It leaves a thin crust on the cellulose which stabilizes it in the attic area. This works off a standard garden hose or will incorporate into a portable water system. Yes, the CM1500 is very capable of wall and glue spray. Components include hoses, spray nozzles, pump, water tank and wall scrubber. June 2016, Cool Machines introduced the new CM1500VHC. 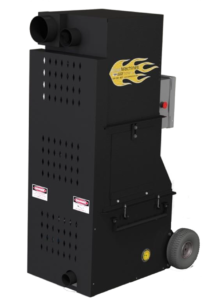 This machine allows you to recycle materials back to the CM1500 using a standard insulation vacuum. 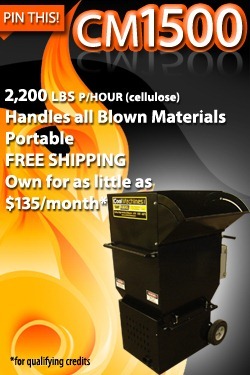 Is the CM1500 able to insulate 3 homes a week (2,500 square feet)? Yes. This machine will provide consistent, reliable service at that level. If you insulate apartments, commercial buildings and large areas consistently, this machine will work, but consider a CM2400. How does the CM1500 perform with dense packing walls? This is a great machine for dense packing. For best performance, the 12 amp motor consistently provides 4-5psi which is an excellent and capable machine for dense packing. Any other requests or information? Great company to work with. Just bought our first vacuum and found Barry had great pricing and awesome service. Very quick to respond to questions and very quick shipping out. We'll be definitely coming back in the future!